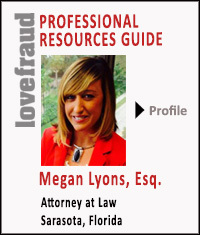 Megan Lyons, Esq., who is based in Sarasota, Florida, is the newest member of the Lovefraud Professional Resources Guide. I have dealt with pathological sociopaths for most of my life in my personal experience, romantically and in the professional arena. As a result of these life changing experiences and relationships, I committed years to studying sociopathy and the recovery from such insidious and sadistic abuse. Because of my personal experience with sociopaths, I am able to provide genuine empathy for my clients as they are navigating through a challenging court battle and the nuances of the legal system with a sociopath. I also provide coaching from a practical perspective, emotionally and mentally because there is significant trauma to process for my clients. I think the biggest issue or challenge for people is accepting the belief that the person is not who they thought they were or that the person has multiple personalities with one being very dangerous and destructive. Also accepting the fact that the person will likely not change and reconciliation is not a likely result. One tip that I can suggest that helped me the most during my recovery is that the experience of healing from a sociopath created a spiritual awakening within myself and an enhanced state of consciousness resulting in a far more happier version of me. I would urge readers to shift their perspective about their experience with a sociopath so that it can provide wisdom to them and a learning experience of a lifetime.